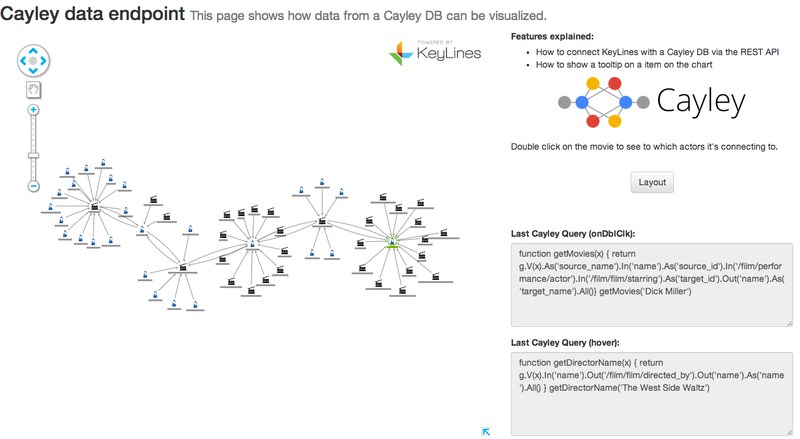 Google dove deeper into the world of graphs last week with their release of Cayley – a new open source graph database. For those of us who can’t get enough of graphs (and graph databases) this is an exciting development. Google have been strong advocates of the power of graphs for some time, but the release of a new database technology backed by the Internet giant can only further increase the visibility of this emerging field. But how can we visualize Cayley? The Cayley database already has a visualization component, but it has limited functionality at the moment. We thought we’d set our new Software Development Intern, Romain, the challenge of building a better Cayley visualization app with KeyLines (on day two of his internship!). Just a day later, he came back with a fully functioning Cayley visualization application. Here’s how he did it. 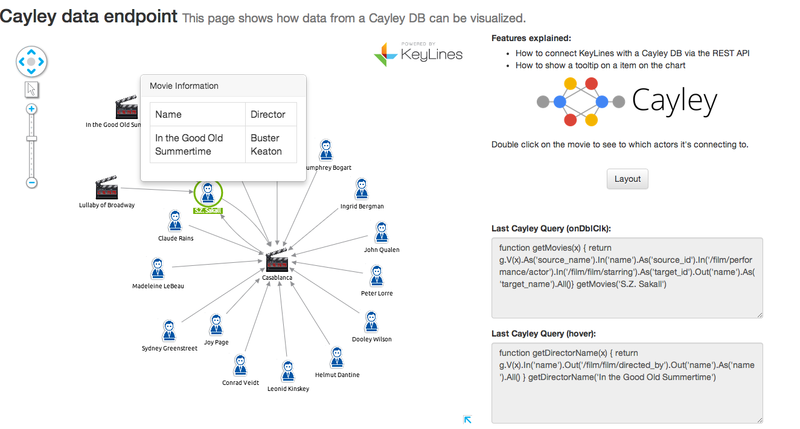 Cayley is a graph database. This means it’s specifically optimized to hold connected, network data. Instead of data being held as a series of tables, it’s stored in a graph model with index-free adjacency. 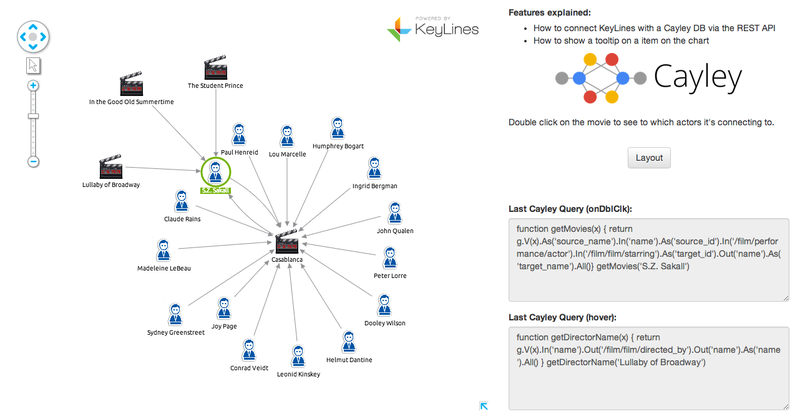 For network visualization tools like KeyLines, it’s a perfect fit. Users can expect high performance, lower latency and aren’t held back by the restrictions of a fixed schema. KeyLines renders the data in the browser, using the HTML5 Canvas element or a WebGL renderer. Download the KeyLines files from the SDK site (contact us for access) then install them on your web server. Create a simple HTML page with references to the KeyLines files and the KeyLines component in a <div>. Again, step-by-step instructions for doing this are available in the KeyLines SDK. Now we have the data in KeyLines, we need to add some functionality to help users make sense of it. In under a day, Romain was able to install Cayley, get started with the KeyLines toolkit and build an entire functioning application. It looks nice too. Hover on any node for more information. Run structural layouts to rearrange your expanded data into a convenient format. 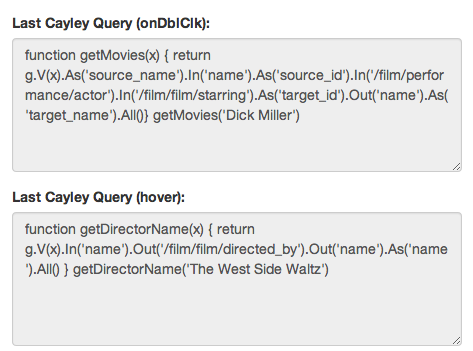 Inspect the queries each time you expand a node or hover.